Over the weekend I went to town on some Easter eggs and came up with a few unusual ways to decorate eggs for the occasion. 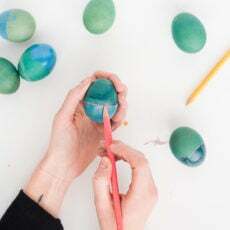 So I’ll be sharing lots of DIY Easter inspiration this month, starting today (technically, I started last week with this Easter egg project, but you know what I mean) with the easiest egg decorating DIY I’ve ever done. Step by Step: This is so simple, you probably don’t need any instructions, but I’ll share ’em anyway… Once you’ve boiled your eggs and they’ve been cooled, you can slowly push thumb tacks in one by one. You want to careful not to push too hard or the egg shell will crack. I found that a back and forth motion as I was gently pushing each tack through worked the best. Continue the process until your egg is completely covered. Depending on how flat the underside of your push pins are you may need a few dabs of glue as well. But I made a half dozen eggs and had no trouble with the pins staying in place without glue. NOTE: This project is for adults only and is not intended for use around young children. 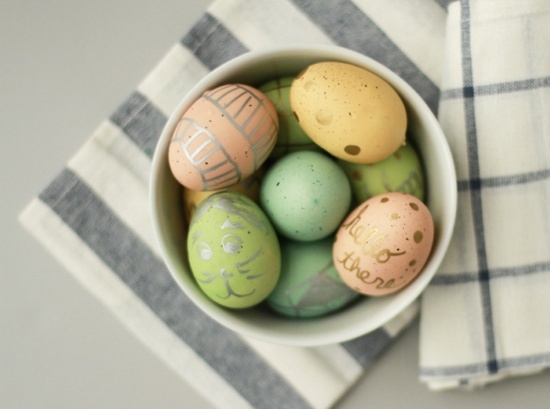 Looking for more Easter DIYs to try? Click here. next post >When Mistakes Happen. Thanks Kelly. Can’t wait to see what you come up with for Easter. P.S. Love your rainbow fascinator on Studio DIY today! Haha Tanya. Yeah, that would probably cause quite the mess if they weren’t hard boiled. 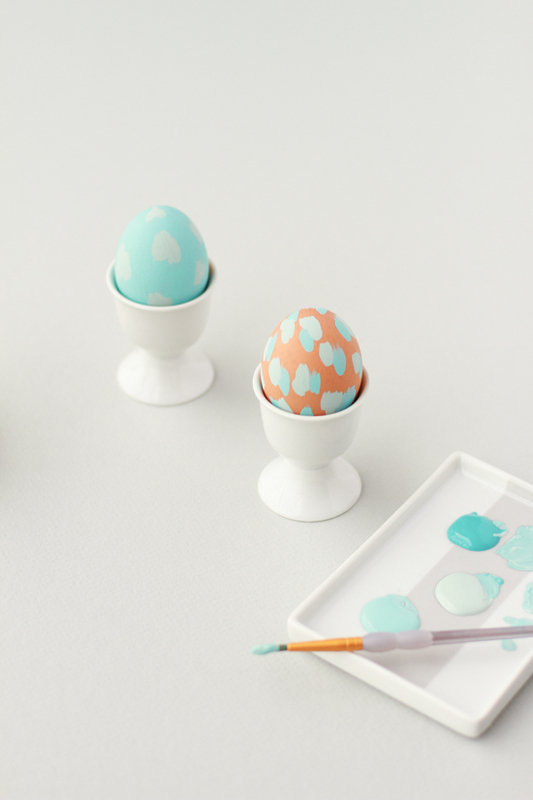 very unusual way to decorate easter eggs, but it looks great! I didnt realise that these were hard boiled at first either – was very intrigued as to how you did it! these are cute, wouldn’t have thought of this! Makes me a bit nervous (children, pets, etc.) May be better using fabric covered styrofoam eggs/balls. Hey Ro. Yes, as I mentioned in the tutorial, this isn’t recommended for use around children. For extra security on the thumb tacks though, you can use a dab of glue on the inside area of each thumb tack before poking it through. great idea! I love finding out new ways to decorate Easter eggs. So it looks like my first comment didn’t make it through moderation. Really, these would be best made the morning you want to use them for decoration, and discarded as soon as possible after you’re finished entertaining. Or maybe you’re just using a magical brand of eggs that doesn’t smell like eggs, in which case please let me in on the secret, because this is a cute project. Hi Bloo. 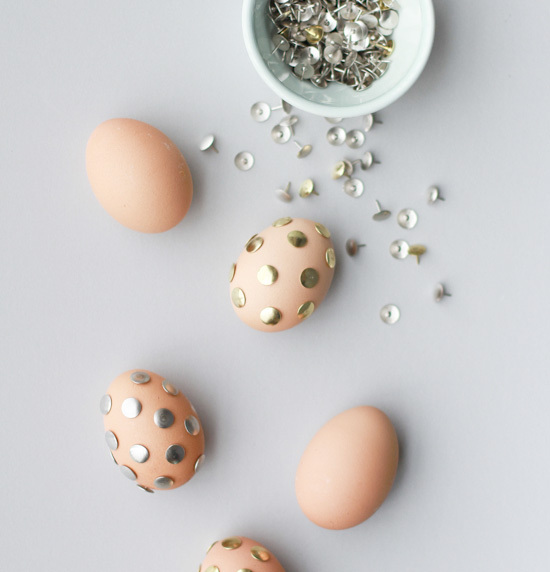 If you use blown eggs (or decorative eggs from the craft store) instead of hardboiled ones you won’t have to worry about that at all. Good luck! This is brilliant! 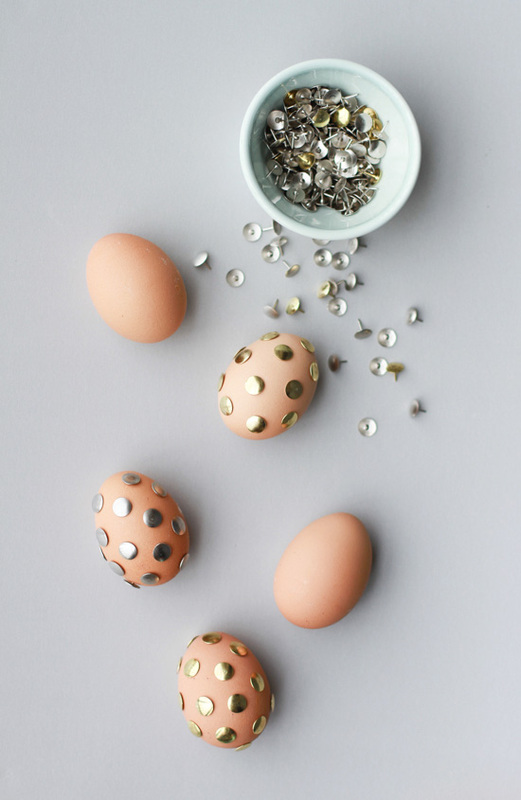 Industrial chic but in the form of an Easter egg! This is crazy awesome! I’m loving all your egg ideas! These are so creative and unique!! Love the colors, too. I featured them on my blog today! http://missloviecreations.blogspot.com/2013/03/12-unique-easter-decorating-ideas.html Stop by and grab a button if you like. Have a happy weekend!! Safer for children and anyone who actually wants to EAT the egg – metallic stickers that come in circles and stars and all sorts of shapes.